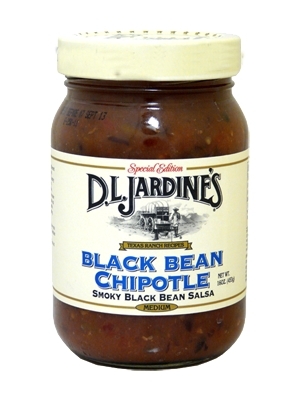 Jardine's Black Bean Chipotle Salsa 16 oz. Tomatoes, black beans, tomato puree, green chilies, onions, water, chipotle peppers (chipotle peppers, water, vinegar, tomatoes, onions, salt, vegetable oil, sugar, spices), vinegar, jalapeno peppers, salt, sugar, garlic, lemon juice concentrate, dehydrated minced onions, dehydrated granulated garlic, spices and hickory smoke flavor. I've been enjoying the Jardine's Peach Salsa for about 15 years and decided to try a few of their other products. This Salsa has moved to the top of my favorites after just 1 jar. It's got a little kick that pleases my taste buds with a nice warm after burn. Outstanding food!